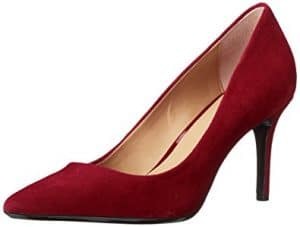 One of the most challenging shoe styles to get a comfortable fit is a women’s dress pump, luckily footwear technology is improving year after year, and now it is easier than ever to find a heel that you can wear for hours. Since everyone’s feet are different what you find comfortable isn’t going to be the same as what your friends like. Some styles come up over and over again as the best for fit and feel, especially if you are going to be on your feet all day at work. The following are the most popular and best brands if you are looking for a comfortable heel for any budget. 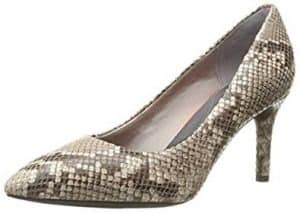 One of the most loved and popular pumps, period, is the Sam Edelman Women’s Hazel. It is known for comfort, style, and moderate price. The heel is a whopping 4″, making it one of the highest on our list. So if you can handle a heel that high, you can wear it for work and is stylish enough to transition to evening outings. The footbed has 4mm of cushioning with good arch support to help make this style comfy to wear. It has a reputation for being good quality, chic, and well-fitting for most women’s feet. They come in a tonne of colors and materials. The Zala from Marc Fisher is getting great reviews for being both fashionable and comfortable. They are a block heel that tends to be easy to wear, especially if you are on your feet or walking around a lot. The Zala comes in a wide range of sizes and widths for all levels of comfort. It has a 3“ heel and comes in a few nice, slightly different color options. I love the Rockport Total Motion line of footwear; if you have a chance, you should try them on. To me, they feel significantly more comfortable than most 3 inch heels in other brands. They have a comfort system that provides lightweight shock absorption; they also have a foam-backed lining with a flexible sole. 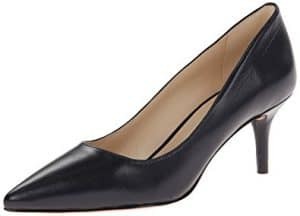 The Total Motion line has a couple of trendy pump options, with the most comfortable being the Rockport Women’s Total Motion Pointed Toe Pump. Everlane is known for their amazingly comfortable clothes, but they also have comfortable shoes that are great for the office. The Day Heel comes in ten different colors and is made of 100% Italian leather. As you can see from the picture, the heel is a block style, which is the most comfortable style of design if you are on your feet all day. They have a definite ballet style look to them, but they are beyond comfy, especially if you are wearing them for long periods. 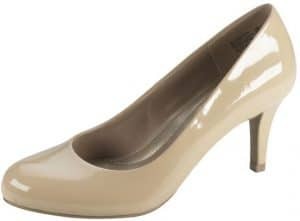 Calvin Klein Women’s Gayle is one of the more comfortable 3-inch heels that you are going to come across. The higher the heel, the more difficult it is to maintain comfort levels, but the Gayle includes comfort gel pods that work well to prevent your feet from getting sore. This pointed-toe style with a sculpted design is great to go from day to night since it falls on the fancier side of pump styles. It isn’t a great design if you have wide feet, as it runs a little narrow. There is a metal Calvin Klein logo on the top back, so be aware of that if that isn’t your kind of thing. They are a stylish looking design that manages somehow to remain comfortable for long periods. The Gayle comes in a vast variety of colors and fabric types. For those who want a comfortable budget option, your best bet is the Comfort Plus by Predictions line. Originally sold at Payless, but now also on Amazon, this style is renowned for its comfort level and low price. It’s not often you get a cheap pair of shoes that also feels great to wear, but the Comfort Plus line is an exception to the rule. You can usually get them for less than $25 making them affordable for almost everyone. They have a soft jersey lining, memory foam insole, and a 3-inch heel. They come in half, and wide sizes and they have a good amount of arch support. This design also has a good grip on the bottom and a flexible outsole that helps to make walking easier. 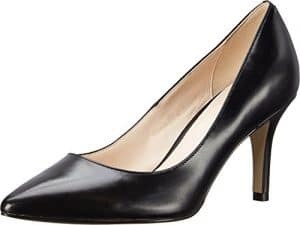 If you want a classic style, the Juliana 75 Dress Pump from Cole Haan is a beautiful leather dress style that is an excellent option for the office. They are somewhat pricey, but the superb quality and material make up for the price tag. The toe is a little pointy and tends to run narrow, so it isn’t the best option if you have wide feet. The heel is around 3″ and contains something called Grand OS technology that is designed to reduce weight and mimic your foot’s natural flexibility while at the same time providing a decent cushioning. Cole Haan footwear is known for being very comfortable and well made. If you like this style but would prefer a shorter heel, there is a Juliana design that has a 45mm height rather than the 75mm height. 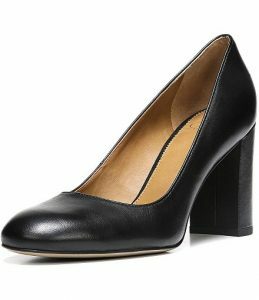 Aerosoles has so many favorite comfortable pumps I had trouble choosing just one. Most of Aerosoles shoes have unique comfort technology that includes a ‘heel rest design,’ so it is designed to distribute your weight onto the back part of the foot and not the ball of your foot. They also have flexible rubber composition soles, and some of the designs have memory foam insoles. If you like a higher option one of Aerosoles best-selling styles is the Major Role (pictured). It has a 3″ covered heel with an angled toe. It comes in a few different color and fabric combinations, and you can get them in medium or wide widths. LifeStride is a brand that is all about comfort. The brand’s tag line is ‘The intersection of comfort and style,’ so you know they are serious about making shoes that you can wear. 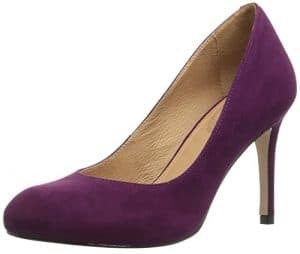 LifeStride have a few different pumps, but one of their most popular is the Parigi. It is a much-loved and very reasonably priced round-toe style that can be either casual, business, or formal. It is super comfy because it has high rebound foam insoles, highly flexible soles and is designed in a way that gives you great arch and foot support to help to make it super comfortable. The heel on the Parigi is 2.625 inches, so it has a bit of height to it, but it isn’t so high that it makes it difficult to walk. The other great thing about this design is that you can get it in narrow, medium or wide widths which is super helpful when you are trying to get the best fit. The upper material is either faux leather or fabric, and it comes in 12 different colors. You will love the sole on this design because it has a traction rubber bottom with little anti-slip bumps that provide a fantastic grip and it isn’t noisy when you walk on hard flooring or tile. 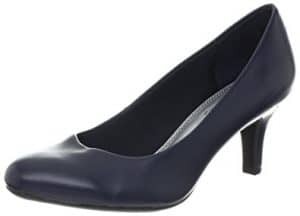 Clarks have a few outstanding options if you are looking for comfort pumps, one of their most popular styles is the Brier Dolly. It is a shoe that is going to give you a lot of height, not only because of the height of the heel (3.25 ” – one of the highest on our list) but because it also has a platform that is .75″ on the soles. Oddly, the platform thickness seems to lessen the feeling of the height; they feel more like you are wearing a lower height, so they manage to be decently comfortable for a lot of people. The platform also makes them look quite stylish. They come in a wide array of colors, and the material is either leather or a synthetic, depending on the color/style that you choose. Wearers of the Brier Dolly find it to have a very comfortable insole that works well for standing or walking for long periods. Corso Como is a comfort conscious brand that have built up a loyal following. They are an Italian company that is focused on designing fashion-forward styles that are also luxuriously comfortable. They are also a brand that is committed to social-environmental best-practices in their factories that are located in Brazil where the shoes are hand assembled. The Corso Como Del is a fantastic pump that does manage to be super stylish and comfortable at the same time despite its 3.5″ height. It is hard to see in the picture, but the Del is designed to have a more round toe area, which is often one of the most painful areas when wearing a high heel. The Del also has a nice, leather padded footbed that has extra foam and a gel pod in the back. It comes in a lot of gorgeous colors as well. 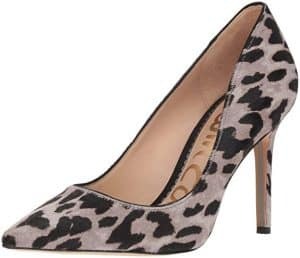 The Michael Kors Dorothy Flex Pump is another perfect 3.25″ heel that is reported to be one of the most comfortable styles around. 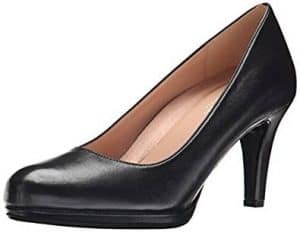 If you go to a downtown business area on any weekday, you will see lots of ladies wearing this shoe. This style has a distinctive metallic button at top back that says, Michael Kors. 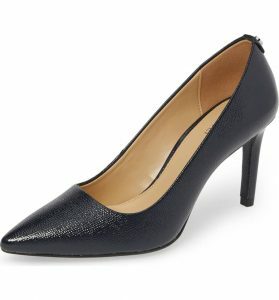 It is a classic pointed toe design that makes this a chic style for the office or a night out. The height of the shoe is stylish, yet isn’t too high to be uncomfortable. Many women find the fit and the feel of this style to be very comfortable due to the memory foam insoles. The Dorothy Flex Pump Pump also has built-in non-skid bottoms to help prevent slipping. The fit is a little bit narrow, so this is not the best choice if you have wide feet. Block designs are considered by many to be more comfortable than a regular heel. A great choice, if you are looking for a block style, is the Franco Sarto Aziza. This style comes in leather, suede, or patent upper. 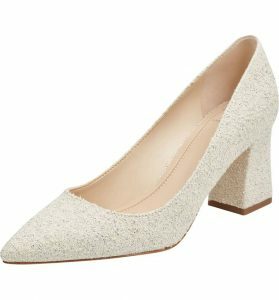 It has a very classic silhouette with a 2 and 3/4 inch block heel. It is a style that works well with either pants or a skirt. Despite being a somewhat bulky looking style, they are very lightweight and easy to walk if you have the correct size and fit. 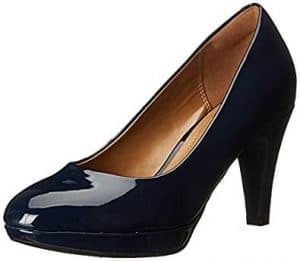 I don’t find Nine West shoes to be particularly comfortable for my feet, but many women have had a good experience with the Nine West Margo design. It is a classic pointed toe style, that is often best suited for those with medium to narrow feet. The height on the Margo is only 2.5 “, so it isn’t so high that it will make your feet hurt. The Margo is one of Nine West’s most popular styles, so it comes in many different colors and hard to find sizes. It works well with business attire or more casual outfits. The Steve Madden Daisie Pointy-Toe has one of the highest heels on our list at 4″. Generally, if you are looking for comfortable footwear, a 4″ style isn’t going to be your first choice. 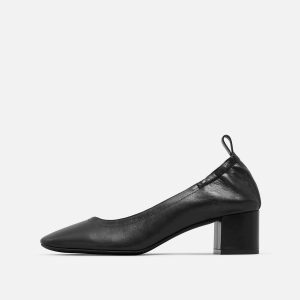 I haven’t personally tried this shoe as there is no way I’m getting into a 4″ style, but women who own this style swear that it is comfortable. Steve Madden styles are known for being comfortable mainly due to their lightly padded footbed, although this style does run a little narrow. Despite the height being 4 inches, many women say that they are easy to walk in. Naturalizer Women’s Michelle is another best-selling comfortable option that you can find all over the place. Naturalizers are typically very comfortable, but when I was trying out the Michelle they seemed to fit kind of tight especially around the toe area, so I didn’t find them all that comfortable, but I did like the style of them. Since everyone’s feet are different, there are a lot of people who do find this style to be very comfortable though. The height is 3″, and the platform is approximately 0.5 inches, some people find that the platform height minimizes the height making the Michelle more comfortable to wear. Material– Leather or suede are excellent materials for comfort in a shoe. Unfortunately, leather is also more expensive than synthetic materials. The better quality the leather, the more you will pay. Leather is good because it will be able to conform to your feet in a way that a synthetic material will not. Leather styles also tend to last longer. Sizing and Fit– The most critical aspect of finding a comfortable shoe is getting the right size and right fit. It is best to try shoes on before buying since dimensions are not standard across different brands. Take your time trying different shoes on, make sure you walk around, if a style doesn’t feel comfortable then don’t buy it. It is always odd to me to see women walking around in shoes that are too big for them; this is especially obvious when wearing heels. When you get the right fit, you will most likely have the most comfortable option for you. Padding– Comfort technology is improving all the time; there are new and innovative ways to provide padding that didn’t exist ten years ago. Look for memory foam, high-density foam, gel pods, or any other type of filling that will go a long way to making it feel much more pleasant to wear for long periods. Height – The higher the heel the less comfortable any footwear is going to be. If you will be on your feet all day, a kitten heel is the best option as it will be the most comfortable. If you don’t like kitten options, a 2″ or 3″ height may also be fine for a lot of women depending on the brand. If you absolutely must have a 4″ style, the most comfortable will be those that have platforms. A platform will lessen the feeling of the 4″ and make it feel more like 3″. Style – Another interesting thing to think about when looking for shoes that will feel the best to wear is the style of the heel. Wedges and block designs are more comfortable than stiletto type options that have a skinny width. 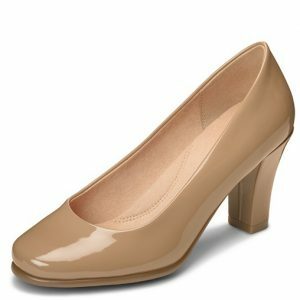 Colors – All of the pumps that we listed above are very popular and come in a wide range of colors. You should be able to find most styles at your local stores (obviously depending on where you live) in black and maybe beige since it is so popular these days. If you are looking for a less common color, try online, as the color selection tends to be much better. Price– For the most part to get a comfortable shoe you need to invest a bit of money. Comfort often (not always) goes up with the amount that you are willing to spend. 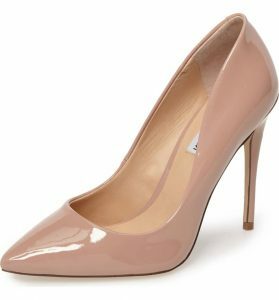 A significant exception to this is the Comfort Plus by Predictions line that offers very comfortable pumps for around the $25 mark. Generally, if you want a good quality, leather, padded shoe that will last, expect to pay at least $80-$100. Width– If you have a wide or a narrow foot, it can be especially challenging to find a great fitting shoe. Some of the most popular styles do not come in narrow or wide. If your foot is narrow, a lot of people like Calvin Klein, Vince Camuto or Nine West pumps, if your foot is wide, you may want to try LifeStride, Aerosole, Rockport or Stuart Weitzman. Toe Box – If your feet are wide (especially in the toe area), you should also pay attention to the style and the size of the toe box on the shoe. Some styles (often pointy toe designs) can be very uncomfortable in the toe area because the toes end up being squished into the toe box. Break-in Period– Hardly any shoe is going to be comfortable to wear right out of the box. At the very least when you first get your shoes, wear them around your house for short periods for a few days. If you are planning on wearing them to work, you should probably wear them for a few hours and bring another pair of shoes to change into. It is unrealistic to expect to wear a pair of pumps without breaking them in a little bit. Other products that can help with comfort– If you do invest in shoes that you are finding to be less than fun to wear, there are a few options that you can try to help with different types of problems you may have. Foot Petals and Dr.Scholls have a whole range of different types of cushioning and pads that you can insert into your shoes for added comfort as well as to prevent slipping and sliding out. You can also get a lot of other contoured foam inserts that can make a huge difference. If your foot is slipping out of the shoe, you may need to get some inexpensive heel grips. High Arches– If you have high arches it is difficult to find designs that can support your feet. You may see that it limits the brands and types of styles you can get, so you may want to invest in some extra arch support product like these from Dr.Scholls. These types of inserts allow you to shop for different brands without having to worry about the amount of arch support a particular shoe has.